WHATEVER HAPPENED TO-----? Rewinding the clock to Avengers Dissassembled we reveal how one of the main players in SECRET INVASION was replaced by a Skrull and what the fallout has been. A major SECRET INVASION chapter is here! Oh, but you want to know exactly who we're talking about right? Spoilers, dude! THE EMPIRE part 3. For 42 issues readers of New Avengers have wondered, who caused the breakout in New Avengers #1 and why? And how was this the real start of the SECRET INVASION? Find out right here!! Special guest artist Jim Cheung returns to these pages for this shocking story. During the INFILTRATION, a Skrull at the heart of the Camp Hammond said these words: "It won't be long until we have a Skrull in every state! "Now that Skrull stands revealed and the fate of The Initiative, the United States, and Planet Earth hang in the balance. 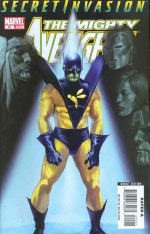 Plus: Former Avenger, Delroy Garret, assumes the mantle and arsenal of Earth's greatest Skrull-Hunter, THE 3-D MAN. He's here to chew bubblegum and kick some Skrull-@$$. And he's all out of bubblegum. Part 2 of 'Cruel and Unusual', as a reeling Matt Murdock is fighting a losing battle defending a man who is on Death Row and has every intention of keeping his execution date. Ed Brubaker continues his excellent Daredevil run.